We aim to understand how the physical properties of lipid and lipid mixtures influence cellular functions that occur at the plasma membrane. 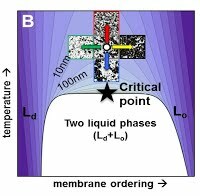 Lipid bilayer membranes containing cholesterol can support two coexisting liquid phases, called liquid-ordered and liquid-disordered. There is evidence that the presence of this phase transition impacts the organization and function of plasma membrane proteins because the cell plasma membrane is poised in the vicinity of a miscibility critical point. We are currently exploring the physical basis of functional lateral heterogeneity in living cell membranes using a variety of experimental and theoretical approaches, including super-resolution fluorescence localization microscopy, fluorescence imaging of fluctuations in isolated plasma membrane vesicles, and Monte Carlo modeling of basic signaling processes. Recognition of antigen by the B cell receptor (BCR) is crucial to the adaptive immune response and, ultimately, defending the body from foreign pathogens. B cell receptors bind to pathogens and other material in the blood and lymph and subsequently send chemical signals informing the rest of the cell. 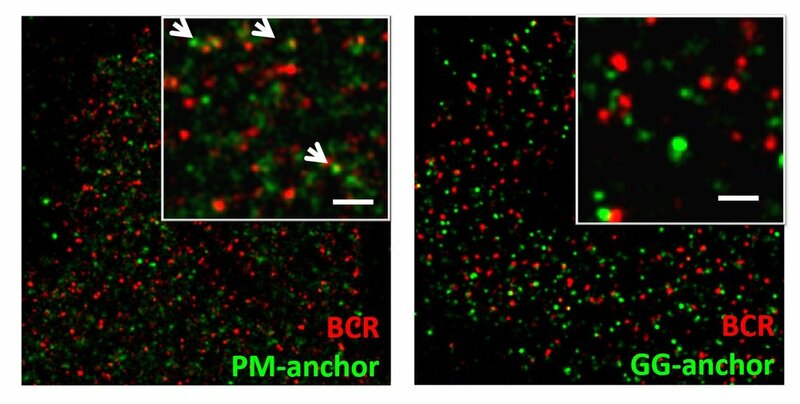 A complex network of proteins regulates BCR signaling. 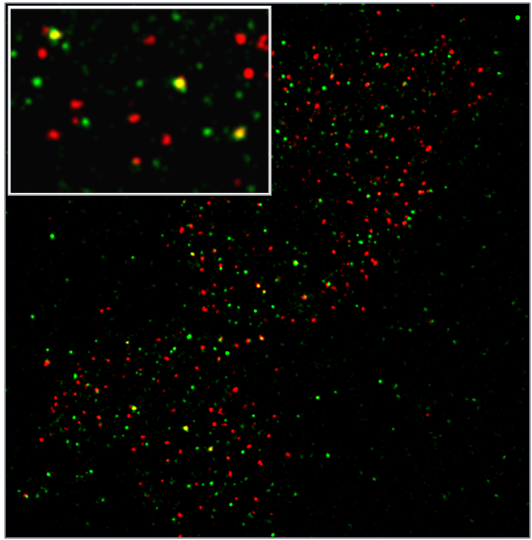 We explore the spatial organization of these proteins in the plasma membrane using two color super-resolution microscopy. We are investigating whether the BCR couples to plasma membrane lipid ordering during antigen stimulation. 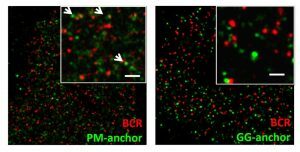 This coupling may act to regulate BCR signaling by organizing membrane-bound regulatory proteins around the BCR. 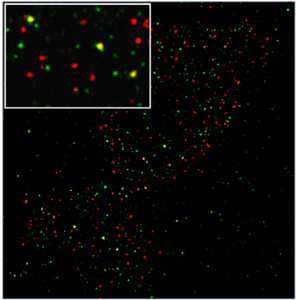 We use an assortment of fluorescently tagged proteins and peptides that can sense membrane organization. We image sets of probes in intact cells under different biological or physical conditions. Here, cells are chemically fixed after the addition of a multivalent antigen against the B cell receptor, a condition that leads to immune signaling. We then quantify the relative distribution of pairs of probes. In this case we find that an ordered phase marker partitions into BCR rich domains, while a disordered phase marker is excluded. Recruitment is temperature dependent, as expected for a lipid mediated process. One feature of critical systems is that they are sensitive to small changes in composition. We exploit this to manipulate lipid-mediated structure and function in cells. We’ve identified a series of compounds that raise or lower critical temperatures in isolated vesicles. Some of these are general anesthetics. We observe a striking relationship between how much treatments lower Tc and anesthetic functions. We are exploring if this is related to the molecular mechanism of general anesthesia. Cells have found ways to change their own critical temperatures. They do this in the cell cycle, during growth arrest, and when cells are grown at different temperatures. We are exploring how and why these changes occur.